My uncle was posted in Bangladesh few years ago. He is a Govt. officer, so he was allotted a furnished villa with a cook and a 24/7 maid. As he went there all alone, because my Aunt is a school teacher in a Govt. school, and my cousin was about to give his board exam, so they had to stay in India. But we used to visit them quite often in Bangladesh during holidays. But my condition was, I can visit your place only if I can get Padmar Ilish. Usually our holidays are always in Summer or October, when ilish availability is not that much. But 'Khala'(means aunt, we used to caal his cook as Khala) used to get good quality Padma r ilish from her cousin, who use to be a fisherman. And most of the time she used to make this 'Ilisher Tel Jhol' with the fish and Kumro Die Ilisher Mathar Chorchori. These 2 items of her were to die for. She always prefer to paste the spice in a mortar & pastel (shil nora) instead of Packet spices. She used to tell me 'Janoto di, amgo ghore packet moshla choilbe na go, ei shil nora e bata moshlar ja sowad, se oi kuta moshla te paba na', means "we never use packet spices in our cooking, the whole spices pasted with mortar & pastel tastes best" So she told me her recipe of Ilisher Tel jhol. Here you go. Ilish macher tel jhol is a typical Bangladeshi item, wher minimum spices are used to cook this dih with raw ilish mach, I mean in this particular dish, Ilish must not be fried before adding into the gravy. Because the smell of the raw ilish is the key ingredient of this item. Today I'm going to share the recipe which I've learnt from a Bangladeshi cook, whom we used to call 'Khala' in Bangladesh. 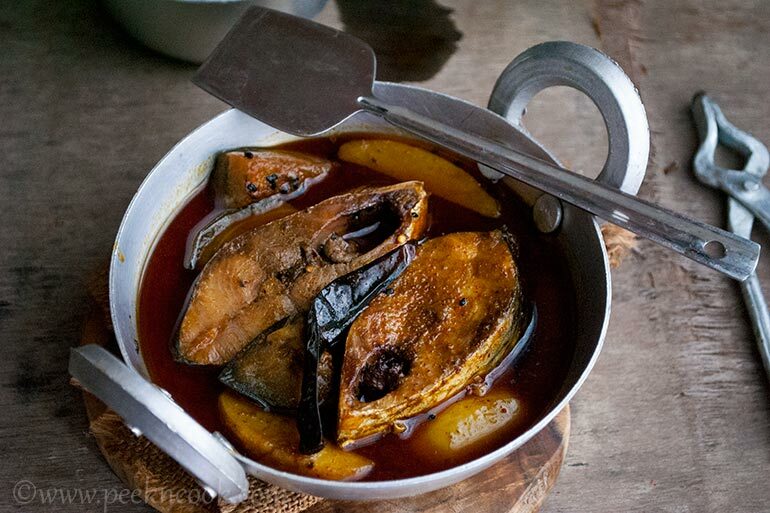 Ilish macher tel jhol is a typical Bangladeshi item, where minimum spices are used to cook this dish with raw ilish mach, I mean in this particular dish, Ilish must not be fried before adding into the gravy. Take the fish pieces, gently wash under tap water, very lightly. Don't wash too much, it'll wash out all the essence of Hilsa. Place the fish on a plate, marinate with salt & turmeric and keep aside. Now soak the red chilis & cumin seeds in a bowl with some water for 30 minutes. After 30 minutes, make a fine paste of the red chili & cumin seeds along with the water and keep aside for later use. If you are using red chili powder & cumin powder, then take a small bowl, add turmeric, red chili & cumin powder, add little water and make a smooth paste. Now heat the oil in a wok till the oil smokes. Temper the oil with whole red chili & kalonji and add the vegetables. Add some salt and fry for some times. Now add the chili & cumin paste, turmeric powder to the wok and sprinkle some water, keep stirring everything genetly for 2 minutes. After 2 minutes add 2 cups of warm water into the wok, add some more salt and cover the wok. Let the gravy to start boiling. When the gravy will start boiling, open the cover and add the marinated fish pieces. Cover the wok again, and now simmer the heat to cook everything on low heat for 6 to 20 minutes. After sometimes, check if the veggies are well cooked or not. If they are cooked enough, open the cover and higher the heat to boil the gravy for 1 minute. After 1 minute, check the salt, add some if needed and turn off the gas. Serve Ilisher Tel Jhol hot with steamed rice. Serve hot Ilisher Tel jhol with plain steamed rice. Ilish goes best with plain steamed rice. Vegetables are optional, if you don't want to add veggies, you can skip easily. You can add plantain/pumpkin instead of eggplant.